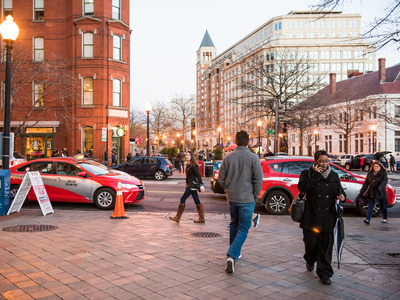 Andriy Blokhin/ShutterstockWashington, DC is looking like the frontrunner for Amazon’s HQ2. Amazon representatives reportedly toured sites across Northern Virginia, Maryland’s Montgomery County, and Washington, DC proper last week. They met with the governor of Virginia and the mayor of Washington, DC, during the trip. This comes as speculation mounts that Amazon has selected the DC area as the frontrunner for its HQ2 project. Amazon representatives toured several sites in the Washington, DC metropolitan area last week, according to a new report in the Washington Post, which cited local officials. The visit is fuelling speculation that the city is being seriously considered in the company’s search for the location of its second headquarters, called HQ2. The Amazon representatives reportedly breakfasted with Virginia Gov. Ralph Northam, had dinner with DC Mayor Muriel Bowser, and saw locations across Virginia, Maryland, and the district, according to the Post. Washington, DC; Northern Virginia; and Montgomery County, Maryland have all been named to Amazon’s short list of HQ2 candidates. Virginia has pitched sites in Alexandria and Arlington, while Washington, DC officials have proposed razing and rezoning a parcel of land near Capitol Hill and RFK stadium for Amazon. Maryland, meanwhile, pointed to an area in White Flint, near a Metro station, as a possible HQ2 location. “We’ve had some really good discussions with Amazon,” Northam said to the Post. The tours are prompting speculation that Amazon has chosen DC as the frontrunner for HQ2, and perhaps is seeing how things shake out between the three shortlisted areas in the metro region before considering other proposals. The DC area is home to at least nine proposed locations for HQ2. The major players are all putting their cards on the table as well. Maryland Gov. Larry Hogan has proposed providing $US5 billion to the company in the form of incentives, while Virginia and DC proper have not officially announced any packages yet. An Amazon spokesperson said in a statement that the company plans to visit each HQ2 location as it tries to make its decision. “Amazon is working with each HQ2 candidate city to dive deeper on their proposals and share additional information about the company’s plans. We’re excited to visit each location and talk about how HQ2 could benefit our employees and the local community,” they said.